NEW YORK —Parents want to feel good about what they put on their baby’s skin — and so does Johnson’s Baby. That’s why the brand is disclosing 100% of the ingredients in its found in its baby products—including those found in fragrances. Fragrance has long been considered a trade secret, but Johnson’s recognizes that today’s parents will feel even more confident in a product if they know 100% of the ingredients. It’s such a noteworthy and industry-leading pledge that the Environmental Working Group (EWG) has taken note: “We applaud Johnson & Johnson’s move to greater transparency in the personal care product market,” said EWG President Ken Cook. Indeed, Johnson’s has always gone the extra mile to ensure that all of the fragrances and ingredients used in its products have gone through rigorous testing to ensure the highest level of safety—fragrance ingredients follow International Fragrance Association global standards, as well as the company’s own five-step safety assurance process. Putting parents and their little ones first comes naturally to Johnson’s. That’s why the brand listened when moms and dads asked for shampoos, lotions and other baby products containing more naturally derived ingredients.In response to those moms and dads, Johnson’s has added ingredients like soybean and coconut oil to both its relaunched line of baby products. As a result, 96% of the ingredients used in the brand’s leading baby products are naturally derived. 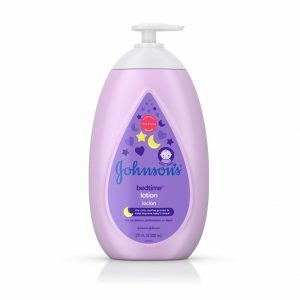 Another request from parents that Johnson’s honored: fewer ingredients overall in the brand’s baby products. Now all products—from the classic Bedtime Baby Lotion to the new CottonTouch Newborn Wash & Shampoo—are free of sulfates and dyes. Overall, the roster of ingredients used in the brand’s baby products was reduced by more than 50%. Johnson’s is sharing 100% of the ingredients used in each product, including fragrances. Not only are all fragrance ingredients disclosed, but company scientists have purposefully steered away from including known and even potentialfragrance allergens. Bottles now have pumps, and a more ergonomic design—so you’ll spend less time fumbling with bottles and more time interacting with your baby. Plus, the new CottonTouch line of products, including a baby wash, are blended with real cotton, which helps enhance and encourage the touching and bonding experience. This is a priority for Johnson’s, which used a patented system to create products that are biodegradable, nontoxic and don’t bioaccumulate in the environment. All of this product evolution helps make one thing transparently clear: Johnson’s commitment to babies around the world is stronger than ever.